In Win introduces the 101 Series PC gaming cases offering the same top-notch quality at a more affordable price point. The In Win 101 cases feature a full-sized tempered glass side panel with aesthetically appealing and smartly laid out interior. It also packs In Win's iconic hexagonal ventilation design that allows cool air to enter through the base and rear side panels. 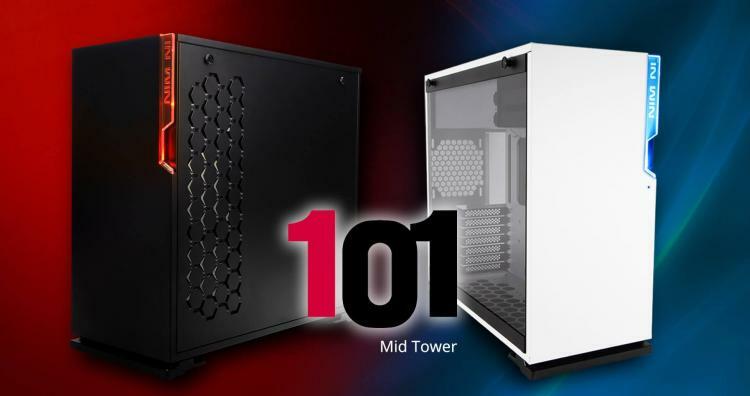 In Win offers the new case in two models - the 101 and 101C models. The In Win 101C offers identical features with the addition of a speedy USB Type-C port along with RGB lighting customization through the RGB lighting controllers or the 4-pin RGB controller headers found in select motherboards. Watch the In Win 101 chassis introduction video below. Both the In Win 101 and 101C supports up to six 120mm fans offering great cooling performance. The 101 Series can also support as large as a 360mm radiator for AIO and custom liquid cooling setup. The In Win 101 Series supports graphics cards as long as 421mm and CPU coolers as tall as 160mm in height. The case also comes in bundled with a graphics card support bracket to support heavier cards and prevent sagging. As for storage drives, the 101 Series supports up to two 3.5-inch hard drives and up to four 2.5-inch drives. For more information regarding the new In Win 101 Series cases, visit the In Win website.